On 2 March, the Southern African Development Community (SADC) Electoral Observation Mission (SEOM) concluded that the 2015 National Assembly Elections in the Kingdom of Lesotho, held on 28 February, were peaceful, transparent, credible, free and fair, thus reflecting the will of the people of the Kingdom of Lesotho. “In this regard, the SEOM urges all political parties and candidates to accept the outcome of the election and encourages any political party or candidate that may wish to challenge the election results to do so in accordance with the laws of the country,” said Maite Nkoana-Mashabane, Minister of International Relations and Cooperation and Head of the SEOM, to the 2015 National Assembly Elections in Lesotho. 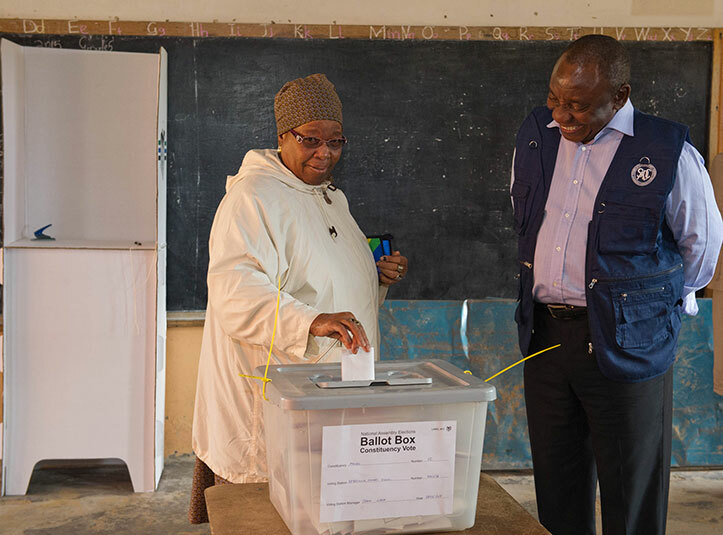 “On behalf of the Chairperson of the SADC Organ on Politics, Defence and Security Cooperation, His Excellency Jacob Zuma, President of the Republic of South Africa, the SEOM commends and salutes the people of the Kingdom of Lesotho for the exemplary manner in which they conducted themselves during this electoral process. In a dignified way, voters stood in long queues waiting for their turn to cast their vote, thus exercising their constitutional right to elect a party/candidate of their choice. "Their homecoming is a beginning of a new chapter … It enables us to celebrate their contribution, and to raise awareness among our people, especially the youth, of what these two great men did for this country." 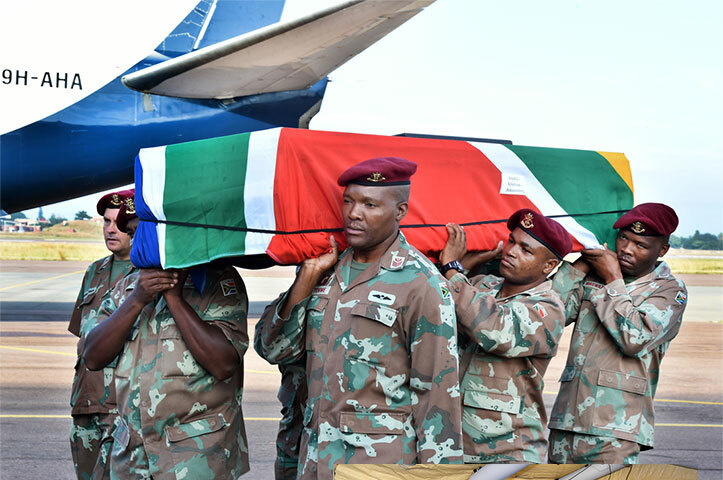 Struggle icons Moses Kotane and JB Marks were given a heroes' welcome by President Jacob Zuma during a ceremony for the repatriation of their remains from Russia at the Waterkloof Airforce Base in Pretoria on 1 March 2015. Political activist and trade unionist John Beaver (JB) Marks served as president of the Transvaal Branch of the African National Congress (ANC) and was elected chairman of the SA Communist Party (SACP) in 1962. In 1963, he was sent to the ANC external mission in Tanzania. He became ill in 1971 and went to the then Soviet Union. He died of a heart attack in Moscow the following year. Kotane was secretary general of the SACP from 1939 until his death in 1978. He was selected to study at the Lenin School in Moscow. Kotane, one of the first activists to be banned under the Suppression of Communism Act, 1950, suffered a stroke in 1968 and went for treatment in the then Soviet Union, where he died in 1978. President Zuma thanked Russian President Vladimir Putin and the Russian Government for caring for the South African struggle stalwarts both in life and in death. 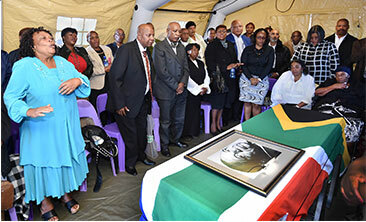 "Their tombstones at the cemetery, which became their temporary home in Moscow, indicated the respect and the status that they were accorded in that country, and further cemented the strong historic ties between South Africa and Russia. 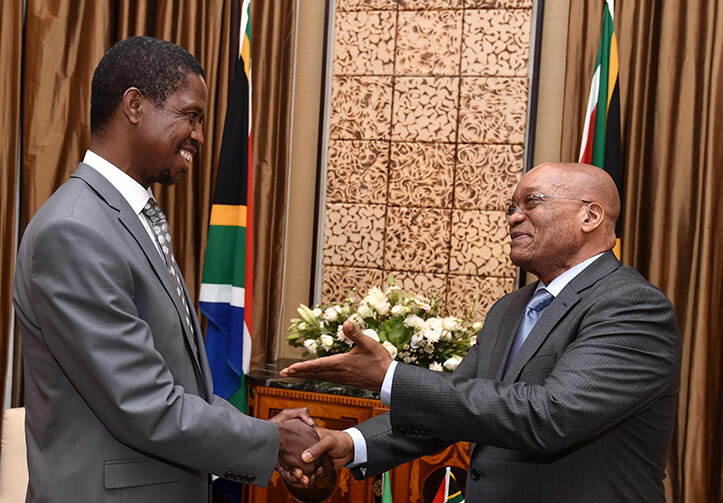 This was President Lungu’s first visit to South Africa since his election on 20 January 2015. South Africa and Zambia recently conducted discussions aimed at fostering increased trade relations for the mutual benefit of both countries. President Jacob Zuma received Zambian President Chagwa Lungu in his capacity as chairperson of the Southern African Development Community Organ on Politics, Defence and Security on 24 February. The two leaders, who discussed a wide range of bilateral, regional and international issues, also acknowledged that Zambia had emerged as one of South Africa’s top three trading partners on the African continent. As such, the two presidents emphasised the need to work towards increased trade between the two countries. President Zuma acknowledged that the long-standing Zambian support for the liberation struggle in South Africa had led to the establishment of deep mutual bonds between the people of these two countries. The South African MeerKAT radio telescope, currently being built outside Carnarvon in the Northern Cape, is a precursor to the Square Kilometre Array (SKA) telescope, to be built in South Africa and in Australia and will be integrated into the SKA during the first phase of construction. 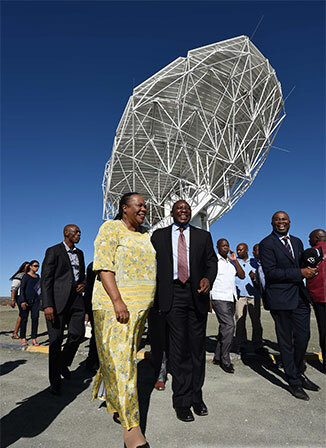 Deputy President Cyril Ramaphosa and the Minister of Science and Technology, Naledi Pandor, unveiled the second of 64 MeerKAT antennas on 28 February 2015. "It is particularly significant that eight other African countries will be involved in hosting the second phase of the project. This promises to establish Africa as a hub for expanding scientific inquiry," said the Deputy President. The event was attended by ministers from the Presidential Infrastructure Coordinating Committee; Northern Cape Premier, Sylvia Lucas; local mayors; community members; and ambassadors and high commissioners from Germany, Portugal, China, Zambia and Mozambique. In appreciating the broader benefits of this project to South Africa, government has identified the construction of the SKA as a strategic infrastructure project overseen by the Presidential Infrastructure Coordinating Committee. During the visit, Deputy President Ramaphosa welcomed the huge benefit brought by hosting the SKA and urged South Africans to take full advantage of this huge project. "The 699 students and postdoctoral fellows that have been supported through the SKA South Africa bursary and fellowship programmes are at the forefront of this effort. "This project is developing technical and artisan skills while producing a new cohort of young scientists", said the Deputy President. The Deputy President also commended Dr Bennie Fanaroff, Director of SKA Project South Africa and the Minister and the former ministers of science and technology for their sterling work in the development of the SKA project. The second dish was named in honour of Dr Fanaroff. 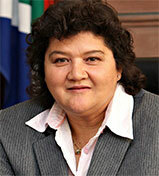 The Minister of Public Enterprises, Lynne Brown, departed for Abu Dhabi in the United Arab Emirates on 25 February 2015, where she visited the Abu Dhabi Defence Exhibition at which Denel, for which she has oversight responsibility, and other South African companies were exhibiting. 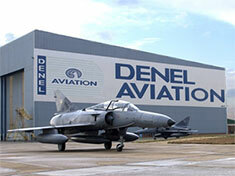 She also supported the activities of a Denel delegation which attended the show to promote its products and services. While in Montevideo, Uruguay, Deputy Minister Landers held bilateral meetings with his counterpart, Deputy Minister Jose-Luis Cancela, and signed a Memorandum of Understanding (MOU) on the establishment of bilateral relations between the two countries. From 1 to 9 March 2015, the Deputy Minister of International Relations and Cooperation, Luwellyn Landers, is visiting three South American countries, beginning in the Oriental Republic of Uruguay, proceeding to the Republic of Chile and concluding the visit in the Republic of Colombia. In Chile, Deputy Minister Landers co-chaired the Fifth Joint Consultative Mechanism (JCM) between South Africa and Chile with his Chilean counterpart. South Africa and Chile enjoy sound bilateral relations which are conducted through the JCM, which is conducted at Deputy Ministerial level. South Africa is Chile's largest trading partner in Africa and South Africa is the biggest investor in Chile’s mining sector. The biggest area of trade between South Africa and Chile is capital goods for mining. Deputy Minister Landers’ visit to Colombia from 8 to 09 March will see the Deputy Minister hold bilateral meetings with his counterpart, Deputy Minister Patti Londono Jaramillo. Relations between South Africa and Colombia were established in 1994 and Colombia opened a resident Embassy in Pretoria in 1995. Bilateral relations between South Africa and Colombia are cordial and growing. Colombia served with South Africa as non-permanent members of the United Nations Security Council from 2011 to 2012. Minister Gigaba said the relevant individuals would receive a long-term visa allowing them multiple entry into the country for the duration of the passport's validity, not exceeding 10 years. Business and diplomatic travellers from South Africa's BRICS partners – Brazil, Russia, India and China – are to receive a port of entry visa into South Africa, the Minister of Home Affairs, Malusi Gigaba, announced recently. "... I have approved the issuance of port of entry visas to BRICS business executives for up to 10 years, with each visit not to exceed 30 days," he told the Cape Town Press Club. 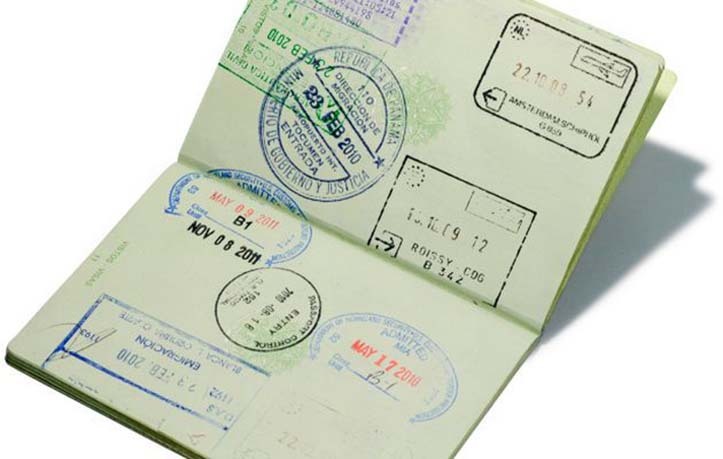 The visas have been in effect since 23 December last year. "This applies to diplomatic, official or service, and ordinary passport holders." It had consulted extensively with the BRICS Business Council and the Department of Trade and Industry department. Minister Gigaba said the four countries presented an "important investment potential".Together with South Africa, the countries comprised 40% of the world's population. Participating countries at CSW59 will be presenting their country reports on achievements made and country positions on a way forward. 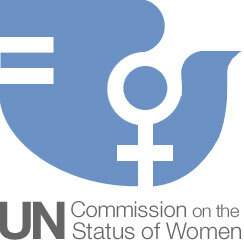 The 59th Session of the Commission on the Status of Women will take place at the United Nations (UN) Headquarters in New York from 9 to 20 March 2015. Representatives of member states, UN entities, and Economic and Social Council-accredited non-governmental organisations from all regions of the world will attend the session. The CSW59 meeting marks the 20-year review of progress countries have made in implementation of the Beijing Platform for Action (Beijing +20) and has seen the global community intensifying efforts towards the achievement of the millennium development goals and the shaping of a Post-2015 Development Agenda and sustainable development goals. The two-day conference was organised by iThemba LABS in collaboration with the International Atomic Energy Agency, the Abdus Salam International Centre for Theoretical Physics and the Third World Academic of Sciences. The Minister of Science and Technology, Naledi Pandor, recently delivered an opening address at the 14th International Conference on PIXE, at the Lord Charles Hotel in Somerset West, near Cape Town. The PIXE Conference's objectives were to present the fundamental physical aspects and applications that can be done with low-energy particle accelerators, particularly in the domain of PIXE. It is a biennial event, which brings together physicists and scientists from different fields of application, including biology, medicine, environmental and Earth sciences, cultural heritage and material research. The PIXE Conference gave the opportunity to South Africa to showcase its expertise in ion beam analysis and PIXE as well as to discuss the possible collaborations related to PIXE research that could be implemented using the new 3.0 MV Tendem Accelarator, funded by the DST/NRF and to be commissioned at the beginning of 2017. The United Nations General Assembly proclaimed 3 March the day of the adoption of the Convention on International Trade in Endangered Species of Wild Fauna and Flora as World Wildlife Day to celebrate and raise awareness of the world’s wild fauna and flora. The Department of Environmental Affairs and South African National Parks (SANParks) celebrated the second World Wildlife Day at Skukuza in the Kruger National Park, Mpumalanga, on 3 March 2015. 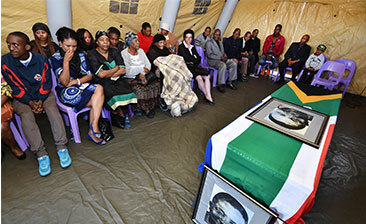 The Minister of Environmental Affairs, Edna Molewa, and the CEO of SANParks, Fundisile Mketeni, led the celebration. The theme for World Wildlife Day 2015 was “Wildlife Crime is Serious: Let’s Get Serious about Wildlife Crime” to highlight the positive role that local communities can play in helping to curb illegal wildlife trade. The conference and seminar sessions, featuring key industry figures, “will offer all visitors the best insight into the industry and focus on the exciting future prospects for this emerging region”, say the organisers, Thebe Reed Exhibitions. Responsible tourism will be a key focus of the World Travel Market Africa (WTM Africa), which runs from 15 to 17 April at the Cape Town International Convention Centre. WTM Africa is expected to exceed all targets and expectations, say the organisers. “The response we have received from exhibitors for our second year has just been tremendous and we are still signing up new exhibitors as we speak,” said Carol Weaving, managing director of Thebe Reed Exhibitions. “WTM Africa was a great success last year. I think our industry was mainly watching from the sidelines on how it would perform, and this year companies who are serious about meeting the right people, conducting productive meetings and getting a return on their investment, do not want to miss out. WTM Africa was held for the first time in 2014. This year, there will be more than 400 exhibiting companies from over 60 countries around the globe, including other parts of Africa. Established in 1973, the Rosslyn plant was the BMW Group's first plant outside of Germany. The one-millionth vehicle, a BMW 3 Series Sedan, rolled off the assembly line at BMW's South African manufacturing plant in Rosslyn, Pretoria, recently. "Globalisation has been an inherent part of our corporate strategy for more than four decades," said Harald Krüger, CEO of BMW South Africa and member of the Management Board of BMW AG responsible for production. 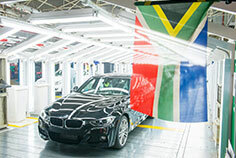 The South African production site "represents a cornerstone" of BMW's global production network of 30 sites in 14 countries, Krüger said, and it remained "a vivid example of a successful market entry through local production". BMW cars made in South Africa are also successful on the international stage. Since its inception, and before the establishment of a dedicated international automobile industry, BMW South Africa has exported cars. In 2014, BMW 3 Series Sedan exports from the Rosslyn line increased by more than 17%, which helped solidify BMW South Africa's position as the country's leading exporter of premium vehicles. BMW South Africa directly and indirectly employs more than 43 000 people: more than 3 700 associates at the plant and at the national sales organisation, as well as more than 3 700 dealership staff and about 36 000 first-tier supplier employees. The Amajimbos, the South African under-17 men's football team, made history as the country's first-ever squad to qualify for the u17 Fifa World Cup, which will take place in Chile from 17 October to 8 November. 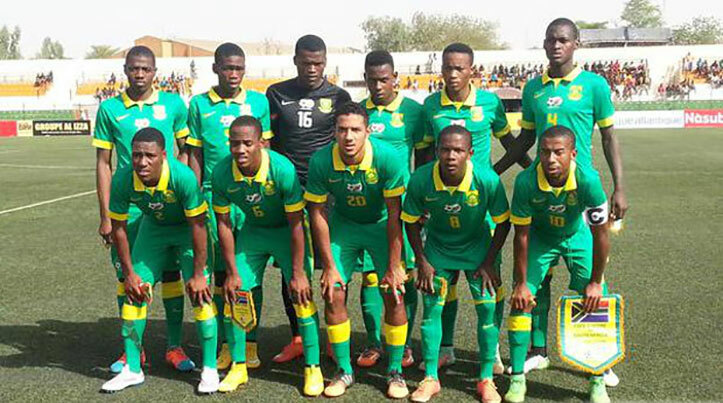 The Amajimbos beat Cameroon 3-1 in their final Group B match at the African Youth Championship at the General Seyni Kountche Stadium in Niamey, Niger. The Amajimbos' win took them to the semifinals of the tournament – as well as secured them a spot at the World Cup – together with Nigeria, Guinea and Mali. "We are grateful to God firstly for always being with us, we believe that the entire country is happy," an elated Amajimbos coach Molefi Ntseki said after the match. Bafana Bafana head coach Shakes Mashaba also applauded the team's significant achievement. "Congratulations to the technical team under the leadership of head coach Molefi Ntseki. "We are also happy for the achievement of the players, the very people who did the business," he said.